May 2016: Co-Chair: Big Data 2.0: Privacy, Security and Analytics panel. MIT CIO Symposium. May 2015: Chair MIT CIO Healthcare Panel. Panel Topic: Inventing Continuity of Care. January 2015. Mentor, and Reviewer. Business Intelligence and Analytics. program. HIMSS 2015 Annual Conference. May 2014: Chair MIT CIO Healthcare Panel. Panel Topic: Transforming Digital Silos to Digital Enterprise. January 2014. Mentor, and Reviewer. Business Intelligence and Analytics. program. HIMSS 2014 Annual Conference. Designing Informatics is quite different than typical Business Intelligence solutions. This book describes innovative way of architecting and implementing Informatics and Analytics in the Healthcare business. April: 2013: SearchHealthIT. 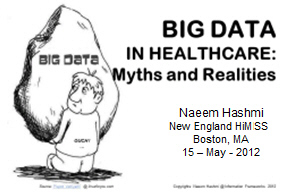 Big data in healthcare: Lots of data but not enough analysis? Analytics or Arithmatics? April 11, 2013: American Hospitals Association Judge: Most Wired Innovator Award 2013. - Liam O'Heir, Vice-President of NES. March 11 2013. Lecture: Innovative Analytics Platform Design Strategies. Harvard University Extension School, Cambridge - Course: ISMT E-180 - Building and Managing Business Intelligence Systems.